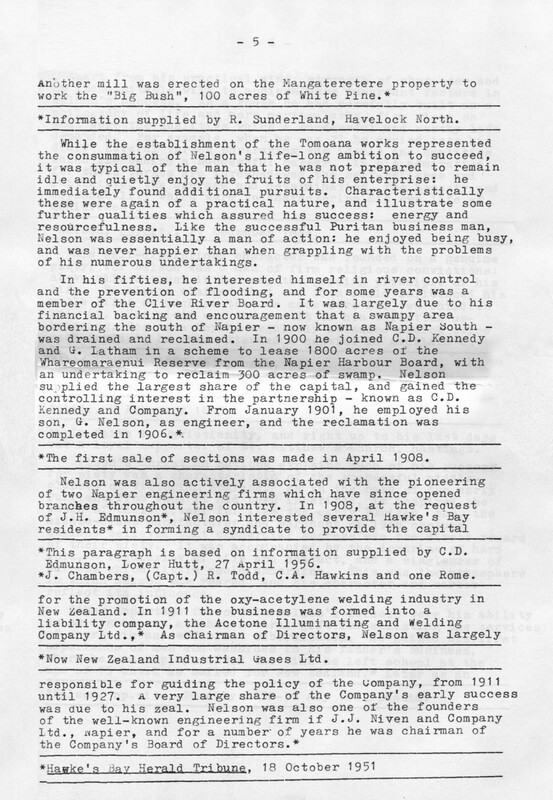 *Unless otherwise indicated this chapter is based on information supplied by G. Nelson, Havelock North, 16 December, 1955. 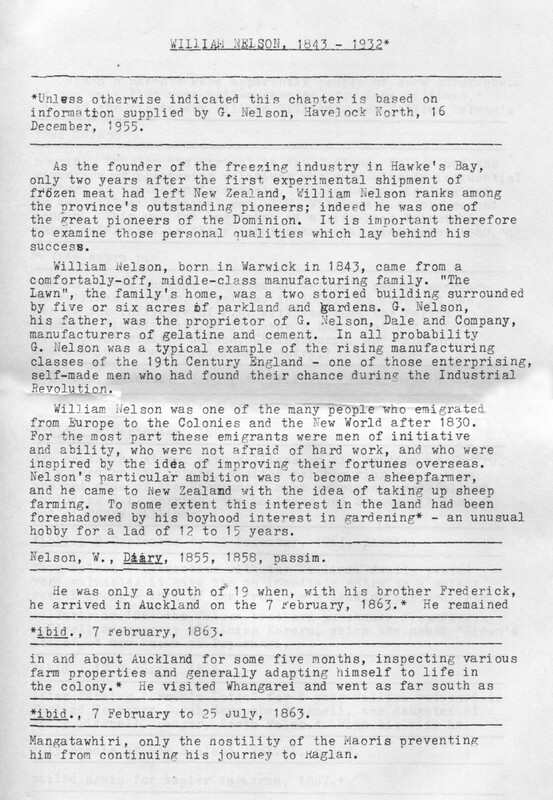 As the founder of the freezing industry in Hawke’s Bay, only two years after the first experimental shipment of frozen meat had left New Zealand, William Nelson ranks among the province’s outstanding pioneers; indeed he was one of the great pioneers of the Dominion. It is important therefore to examine those personal qualities which lay behind his success. William Nelson, born in Warwick in 1843, came from a comfortably-off, middle-class manufacturing family. “The Lawn”, the family’s home, was a two storied building surrounded by five or six acres of parkland and gardens. G. Nelson, his father, was the proprietor of G. Nelson, Dale and Company, manufacturers of gelatine and cement. In all probability G. Nelson was a typical example of the rising manufacturing classes of the 19th Century England – one of those enterprising, self-made men who had found their chance during the Industrial Revolution. William Nelson was one of the many people who emigrated from Europe to the Colonies and the New World after 1830. For the most part these emigrants were men of initiative and ability, who were not afraid of hard work, and who were inspired by the idea of improving their fortunes overseas. Nelson’s particular ambition was to become a sheep farmer, and he came to New Zealand with the idea of taking up sheep farming. To some extent this interest in the land had been foreshadowed by his boyhood interest in gardening* – an unusual hobby for a lad of 12 to 15 years. Nelson, W., Diary, 1855, 1858, passim. *ibid., 7 February to 25 July, 1863. Mangatawhiri, only the hostility of the Maoris preventing him from continuing his journey to Raglan. * Nelson, op. cit., 23 July to 21 August 1863, passim. few months he stayed with Williams on his station at Kereru. He worked on the estate, visited neighbouring properties and met some of the Province’s most prominent pastoralists, including J.L. 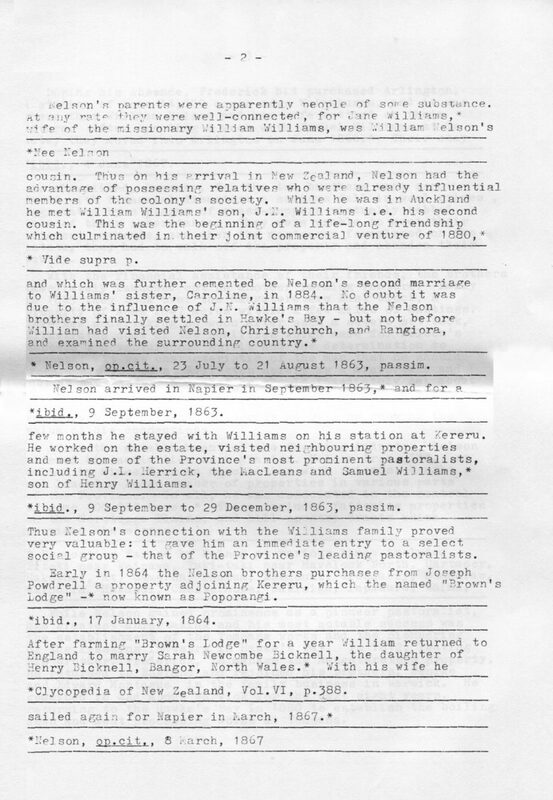 Herrick, the MacLeans [ McLeans ] and Samuel Williams,* son of Henry Williams. *ibid., 9 September to 29 December, 1863, passim. Thus Nelson’s connection with the Williams family proved very valuable: it gave him an immediate entry to a select social group – that of the Province’s leading pastoralists. Early in 1864 the Nelson brothers purchases from Joseph Powdrell a property adjoining Kereru, which the named “Brown’s Lodge” -* now known as Poporangi. *Cyclopedia of New Zealand, Vol. VI, p. 388. *Nelson, op. cit., 8 March, 1867.
was shortlived, however, for the two brothers were soon faced with financial disaster: a serious fall in wool prices, aggravated by a plague of grass-hoppers virtually robbed them of their inheritance. They were unable to meet their interest payments, and when the mortgagee foreclosed on the estate, they had to walk off the property and abandon their equity. With the financial assistance of their friends, the brothers immediately launched out on another farming venture. Early in 1869 they took over the Mangateretere East block, a property of some 2047 acres within a few miles of Hastings. This new undertaking so soon after such a severe set back, illustrates some of the qualities which made for Nelson’s success: a venturesome spirit and the determination to succeed. It was characteristic of the man that he should regard his losses at Arlington merely as a misfortune and not as a disaster, and that he should immediately set about to retrieve his position. The fact that he was able to obtain financial assistance from his friends at such a time emphasises his personal integrity as well as showing the value of his connections. After the establishment of the freezing industry, Nelson widened his activities as a grazier. 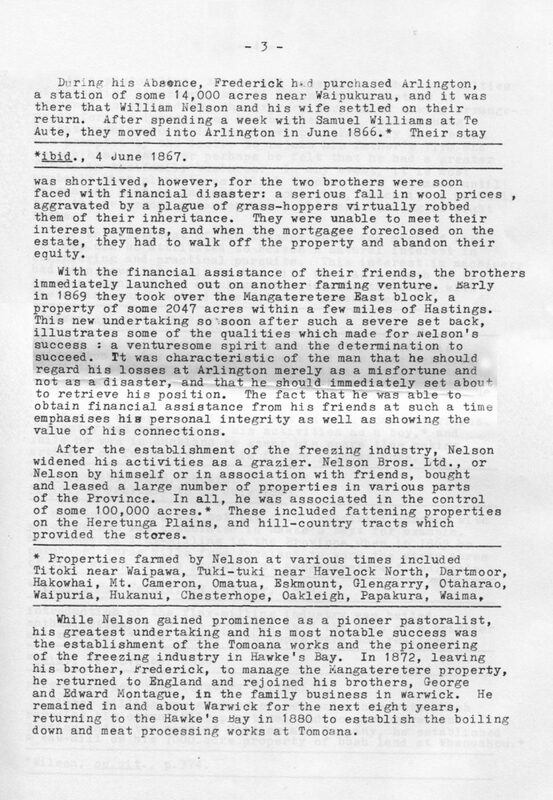 Nelson Bros. Ltd., or Nelson by himself or in association with friends, bought and leased a large number of properties in various parts of the Province. In all, he was associated in the control of some 100,000 acres. * These included fattening properties on the Heretunga [ Heretaunga ] Plains, and hill-country tracts which provided the stores. * Properties farmed by Nelson at various times included Titoki near Waipawa, Tuki-tuki near Havelock North, Dartmoor, Hakowhai, Mt. Cameron, Omatua, Eskmount, Glengarry, Otaharao, Waipuria, Hukanui, Chesterhope, Oakleigh, Papakura, Waima. While Nelson gained prominence as a pioneer pastoralist, his greatest undertaking and his most notable success was the establishment of the Tomoana works and the pioneering of the freezing industry in Hawke’s Bay. In 1872, leaving his brother, Frederick, to manage the Mangateretere property, he returned to England and rejoined his brothers, George and Edward Montague, in the family business in Warwick. He remained in and about Warwick for the next eight years, returning to the Hawke’s bay in 1880 to establish the boiling down and meat processing works at Tomoana. As a pastoralist, Nelson had experienced the difficulties of marketing livestock, but it is uncertain whether he returned to England for the express purpose of making arrangements for, or interesting his brothers in, establishing a meat canning works in the Province. 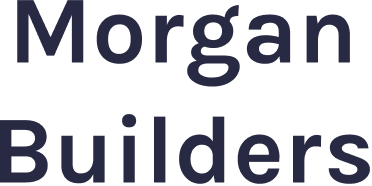 Possibly his return was prompted by the desire to rejoin his father’s firm and recoup his losses, or perhaps he felt that he had a greater future in the family business. In any event, it is most probable that plans to establish Tomoana were not made until Nelson had been in England for some time, since it is unlikely that the necessary arrangements would take as long as eight years. *Nelson op cit., 1862, passim. *ibid., 7 February to 25 July 1863. *Hawke’s Bay Herald, 29 October, 1869.
prices slumped; the industry failed. *Information supplied by R. Sunderland, Havelock North. 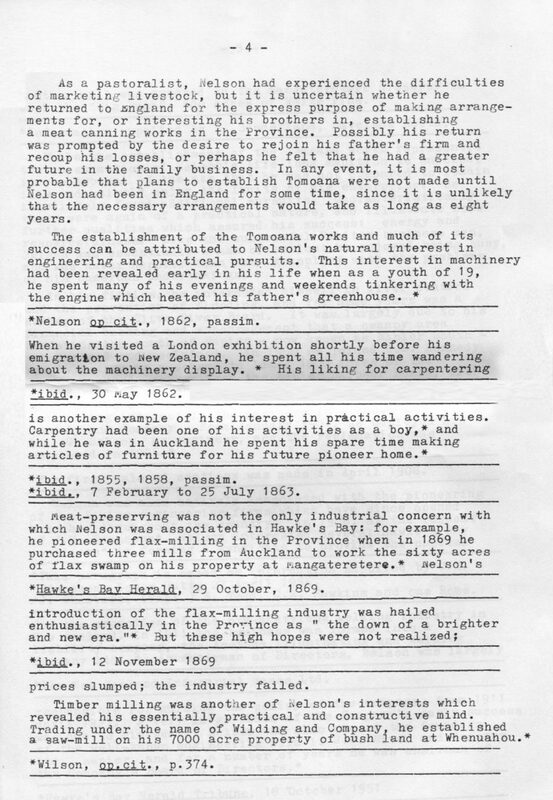 While the establishment of the Tomoana works represented the consummation of Nelson’s life-long ambition to succeed, it was typical of the man that he was not prepared to remain idle and quietly enjoy the fruits of his enterprise: he immediately found additional pursuits. Characteristically these were again of a practical nature, and illustrate some further qualities which assured his success: energy and resourcefulness. Like the successful Puritan business man, Nelson was essentially a man of action: he enjoyed being busy, and was never happier than when grappling with the problems of his numerous undertakings. *The first sale of sections was made in April 1908. *This paragraph is based on information supplied by C.D. Edmunson, Lower Hutt, 27 April 1956. *J. Chambers, (Capt.) R. Todd, C.A. Hawkins and one Rome. *Now New Zealand Industrial Gases Ltd.
Apart from his practical mind, strength of character and an indominitable [indomitable] will to achieve were important factors in Nelson’s success. As a youth he had carefully built up a philosophy of life and more particularly, firm views on what were the qualities which a successful and worthy life demanded. For example, when he was 21 he copied into his diary* several verses portraying the ideals and qualities which lie behind a successful career. In his admiration for these verses are foreshadowed the self-reliance and initiative, the courage and determination, the honesty and dependability which were to characterise his own life of achievement. *Nelson, op. cit., 21 December 1864.
early faith in Christianity, and right up to his last days he was a loyal supporter of St. Matthew’s Church, Hastings. 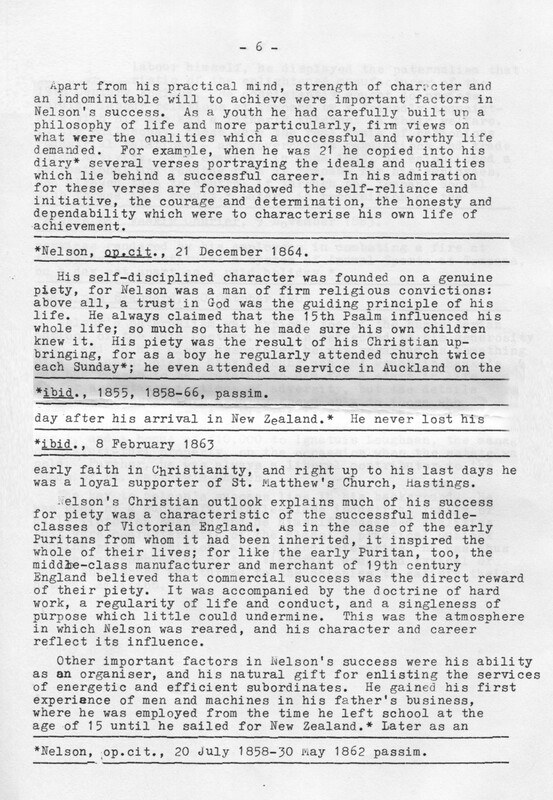 Nelson’s Christian outlook explains much of his success for piety was a characteristic of the successful middle-classes of Victorian England. As in the case of the early Puritans from whom it had been inherited, it inspired the whole of their lives; for like the early Puritan, too, the middle-class manufacturer and merchant of 19th century England believed that commercial success was the direct reward of their piety. It was accompanied by the doctrine of hard work, a regularity of life and conduct, and a singleness of purpose which little could undermine. This was the atmosphere in which Nelson was reared, and his character and career reflect its influence. *Nelson, op. cit., 20 July 1858-30 may 1862 passim. *Hawkes Bay Weekly Courier, 9 November 1883. Nelson’s paternalism was typical too of the humanitarian outlook of the 19th Century. It is reflected in his generosity also, and to his close associates he was regarded as something of a philanthropist. Many a young man and woman in Hawke’s Bay had reason to be grateful to him for a start in life or for assistance in times of adversity, but the details of his generosity were usually known only to those who were directly concerned. His outright gifts included an annual donation of £500 to the Salvation Army during World War 1, and a bonus of £10,000 to Ignatuis [ Ignatuius ] Loughnan, the manager of his Tuki-tuki property, on the occassion when the estate was sold. 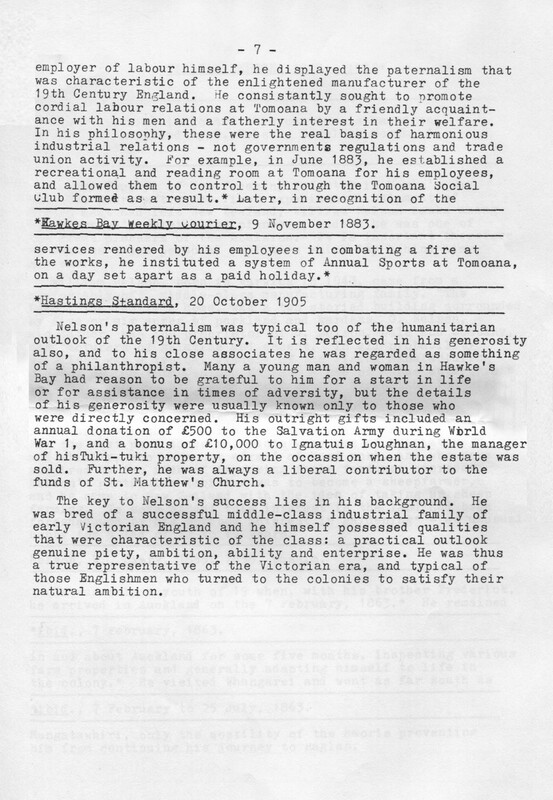 Further, he was always a liberal contributor to the funds of St. Matthew’s Church. The key to Nelson’s success lies in his background. He was bred of a successful middle-class industrial family of early Victorian England and he himself possessed qualities that were characteristic of the class: a practical outlook genuine piety, ambition, ability and enterprise. He was thus a true representative of the Victorian era, and typical of those Englishmen who turned to the colonies to satisfy their natural ambition.